Howe also refers to this site as Rancho Chuparosa. A rock shelter had faint red stains suggestive of pictographs. There were three small caves but the ranch owners cleaned out most of the materials; some basketry found in the caves (Howe, 1954/1984). 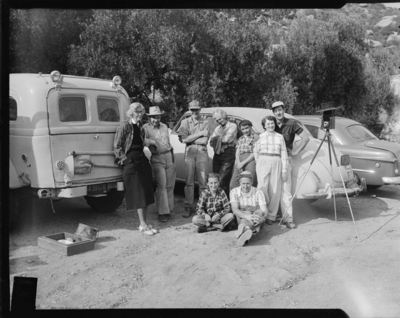 Group of nine people posing in front of three vehicles; a hat is atop a camera on a tripod. ASA001-1113 was published in ASA Bulletin (Blast from the past, 1990); from left are Gordon and Lucille Redtfeldt second and third, Verna Howe sixth, Clyde Price eighth (Letters, 1990). Howe (1954/1984) mentions group members Lily Colvin, Harford Bridges, Mr. and Mrs. Clyde Price, and Mr. and Mrs. Howe.